Wow, "Did we pick the right weekend to see the leaves or what?" The Hi Lites Motor Club will be participating in a “Fall Foliage Travel Cruise” on Sunday, October 6th. We started this tradition last year and had an absolute blast. 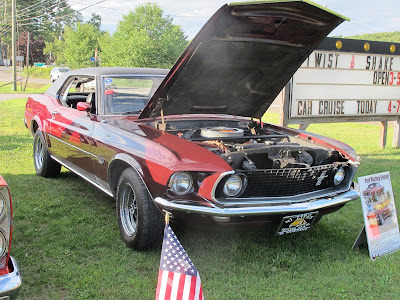 We take a easy ride (5 mph under the speed limit) with a large lineup of beautiful cars and get more looks, waves and cheers than the train ride at Knoebels. Last year we had 23 cars and about 30 participants. This year we hope to make the event even bigger. Cars will start to gather at 8:30 AM at “Gunn Brothers Garage” (across rt 118 from the Citco Station in Lehman) and will head out at 9:00 AM. We are planning on having some coffee and light snacks between 8:30 and 9:00. The travel cruise will head out to the “Quaker Steak and Lube" restaurant located in the Buckhorn section of Bloomsburg. The travel path will have us head west on RT118, turn left onto 487 South and then take the onramp to I 80 in Bloomsburg. The restaurant is just off the Buckhorn exit on I 80. After spending some time at the Bike Barn, we will continue on Rt 11 North and arrive back in Lehman sometime mid afternoon. Although participants are not required to travel to Bill's Bike Barn, we would ask that those who choose to head home after the meal, wait in the Quaker Steak and Lube parking lot until all others who will be following the cruise have left for Bill's Bile Barn. Last year there was a lot of confusion when cars wanting to go to Bill's were following cars that were heading home. After a nice meal and a few photos, participants are welcome to continue on with the cruise to “Bill's Bike Barn, located only a short distance away, (10 -15 min) where participants will be able to see vintage motorcycles, military displays, and vintage posters and memorabilia. (Check out their web site). There is $5.00 admission per person to Bill's.